I am a brand new rider and just mastering 1st gear - my motorcycle course is in two weeks. My Husband has a Vulcan 1500 but I had read that the biggest mistake a woman rider can make is to buy a bike too big for her to start out. It can make you nervous and never feel comfortable driving. I decided that this bike was big enough for me for my first year. I already have bike envy and want a bigger bike! I love my new bike and I can't wait to get my license so my Husband and I can take some trips. I downgraded from 450 to 250 because I was never comfortable riding the 450. I am recently divorced after 20 years of marriage. I am about to turn 59 yrs. old. Needless to say my whole life is changing. I am going to college for the first time in my life studying Practical Nursing. 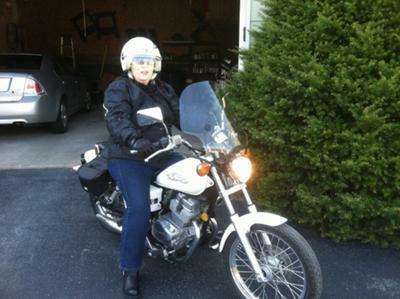 My 36 yr. old daughter rides a Suzuki Boulevard but she has been riding for years. This year I got the bug!!! So if any of you know of a good deal on a Honda Rebel 250 please let me know. I am signing up for the Motorcycle Safety Course this month. I am not in a big hurry to purchase a bike because I need the best deal I can get. Happy and safe riding to all of you!!! No shame at all in starting small. My plan was to buy a dual sport, which I did, a Honda CRF 230. I wanted to do more dirt riding, but I felt bad not having the endurance to keep up with my friends. Even though my husband said it was OK to only go out for a couple hours, I could tell it really wasn't. So, I ended up riding on the road a lot more - I routed all back roads to the office, meetings, anywhere I had to go I took the long way (60 on a 230 dualie is screamin'). I sold it the month after I paid it off & bought a Royal Enfield bullet 500. It's still a small bike, but can do 80 without a problem. I love it. I'm still not so sure I want to ride it all the way to Laconia, it's a bit stiff in the seat. I used the Rebel in my safety course and really liked it. I was a slow learner when it came to looking where I wanted to go, but after many Saturday afternoons in an empty parking lot with my husband, I finally got the hang of it. I bout a Harley Softail Delixe after finishing the course and have never looked back. After two years and 11,000 miles I am loving it. You need to ride what you are comfortable with and just enjoy the ride. I too have a Honda Rebel 250, I have told many people that I am quite happy with the size of this bike, and I don't need to go any faster or have a bike any bigger. I learned how to ride the year before last, didn't have much of a chance to ride it last year due to the weather, so I'm hoping to get it out more this summer and ride. I also took the motorcycle safety course, and that was the best thing I could have done. I had 2 very good instructors and we all had fun while learning. I think everyone in the class passed, so don't worry, if your instructors are like mine, they will help you if you are having problems, they took the extra time to help the ones in my class that couldn't "get" it right away. So good luck, and happy riding! I've been riding for over 40 years. For the past 6 years I've been riding a Rebel. It fits well, I feel in control and won't go back to a bigger bike. I'm slightly under 5'so it's right for me. I ride in a club with Harley's, Gold Wings, Yahamas and various others - all bigger but it doesn't seem to matter. The only thing I wish was different is the noise level. I love rumbling loud pipes! My first bike was a Rebel 250today too! Great bike to cut your teeth on & gain confidence! Enjoy! You go! I rode a rebel for 2 years and loved it. It is a very forgiving bike, and I rode with the big boys on their Harleys. I now have my own "Piglet" a Sportster SuperLow. I love it even more. Just practice practice practice. Add a little bit at a time and always remember to ride your own ride. And yes you do need to look where you want the bike to go, the turning your head thing. Feels a bit odd at first but really does work. Have a great time with little victories! Enjoy! This will be my third summer and I'm still riding my Rebel. I have bike envy too, and I think I'll know when I'm ready for a bigger bike - and that may be never! Just take it a day at time and enjoy! And you'll do great in the motorcycle course! Thanks so much for all the positive comments. I am so excited to master my new bike, feel the wind in my hair and pick the bugs out of my teeth! I am very nervous about the course though. I read all the comments on this website from the women that failed the first time. I've also read about cornering; which has me a bit nervous. I don't quite get the looking where you want to go and not at the road but I guess it's only because I haven't done it yet. It will probably more sense to me once I get out there and try it. We are going out this weekend to practice some more. I bougt fringe handlebar wraps, a peg cover (wouldn't want to scuff my new boots, a kick plate stand (for the days at the beach), a decal for my helmet (Hello Kitty holding a gun) and a combodana. I figure if I can't master the bike; I'll at least look good!!! The biggest mistake I made was learning how to ride on a Shadow ACE 1100. It was too heavy and too tall (I was always on tippy toes). I didn't lean into a curve for over a year - scared the POO out of friends riding behind me. And I believe it took me twice as long to become really good at the fundamentals. Go for the smaller bike Girl Friend and start out right. Best of luck and happy riding! I started on a Rebel and the next season, I got a Honda Shadow VLX. My Rebel then went to my friend to learn on, then it went to one of her friends for his wife. I have another friend who has a black Rebel and she loves it! I guess my point is that the Rebel is a great bike to learn on. As with any bike though, safety is the key. And by the photo you posted, it looks like you have that in the bag! Congrats! I started w/a small bike-6 years later I ride a softail deluxe. Love it! You go girl! Start small and then when you've mastered that 250, go BIG!